Your membership is good for a calendar year, normally beginning the month you originally joined. A yearly renewal notice with a return envelope is sent out by mail at the beginning of your renewal month. Your membership lapses at the end of that month. 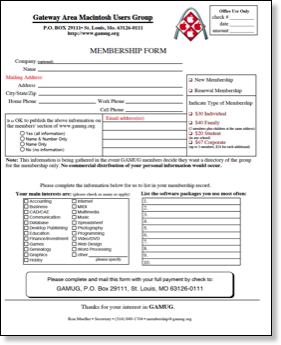 Lapsed members receive GAMUG emails for three additional months, but if you have not yet renewed by the end of that period, your membership expires. Only current, paid members are eligible for the Membership Rewards Program. To renew, send the notice with your payment to our address listed on the form. If you misplace this form, you will find a link here to a PDF form which you can type into, print, and then follow the instruction above.